An under construction overhead bridge in Maitighar of Kathmandu, in December 2018. 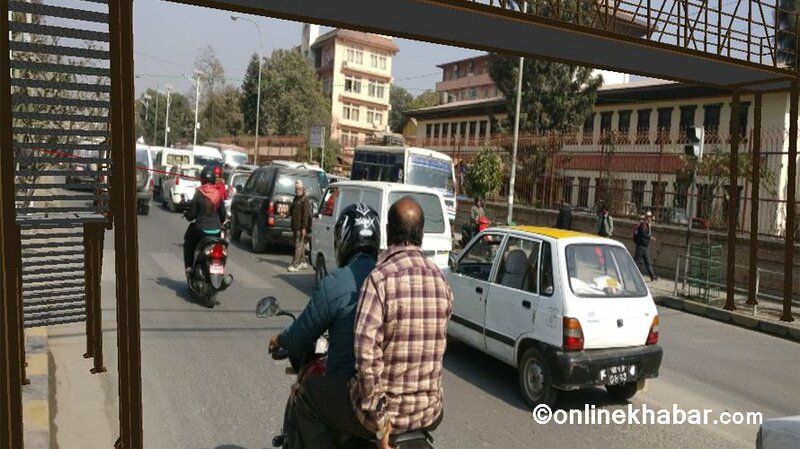 The Kathmandu Metropolitan City is installing two overhead bridges in two of the busiest crossings of the city, namely Maitighar and Chabahil. The local government says the bridges will be movable; hence it can relocate them wherever necessary. The construction works have already begun in front of the Supreme Court in Maitighar. The KMC has hoped that the installing of these bridges will facilitate the smooth traffic management of the city whereas it will result in the safety of pedestrians. The number of accidents will decrease. Meanwhile, the local government has decided not to let anyone project their advertisements at these bridges, so as to ensure that the aesthetics of the city is maintained. Chief of the KMC Department of Urban Infrastructure Development Department, Narayan Babu Bhattarai, says the KMC will coordinate with the Department of Roads during the construction process. The total project is estimated to cost Rs 18 million.